Susan Ashton has for many years been a favorite, and here she sings The Revelation Song at the Ryman Auditorium, part of a Songs 4 Worship Country. 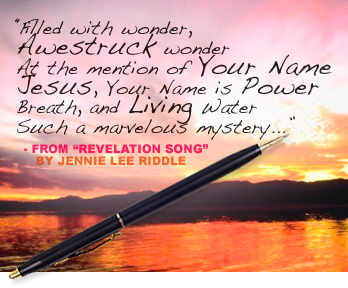 Read more about Jennie’s story of how the song was birthed in her article on PraiseCharts.com. Also visit her on Myspace or at her official website, www.jennieriddle.com. One of the worst five movies I’ve ever seen. A work of literary fiction turned into a movie that fell flat. This review explains. I used to make a big deal about the difference between time in the U.S. and Uganda. I would ask American audiences, “Time is . . . what?” Of course they would answer as you are in your mind: money. Time is money. Then I would say that in Uganda, if you asked, people would say “Time is . . . for friendship.” People love to host others in their homes and time seems plentiful to enjoy relationships. But this is not the case in an ever-changing Ugandan culture where cell phones abound. I remember in 1999 a South African company had a slogan, “A Cell for every Ugandan” or something like that. It didn’t seem possible, and why would someone without clean water need a cell phone? Well little more than a decade later, it’s really true. MTN was right. Cell phone networks grew and other companies came and it’s hard to find a Ugandan without a cell phone per family at least. And it’s funny how the long greetings have changed based on economic and social and technological factors. Now, air time is literally money. Money is exchanged on the air from person to person, phone to phone to pay for school fees, pay someone for a bag of corn, or to buy a coffin. Part of the culture of visiting someone is that you often don’t ask why they have come. It would be rude, for example, to say, “What can I do for you?” when someone drops by your house. Isn’t it good enough just to see and visit with me? the visitor might think. So often there’s a lot of serving drinks and food and conversation, but for American sensibilities, we would often want the person to come out with it earlier in the visit. But when using cell phones, a person calling is using air time and quickly comes out with the request, the reason for calling. Maybe time is still largely for friendship in Uganda but increasingly time is money. In many ways this is helpful to Ugandans. I mentioned above the bad assumption that a person must somehow go up the hierarchy of needs to get water before a cell phone. This is incorrect and presumptuous. Yes, at the same time a village may be struggling to get clean water, a cell phone still saves time from sending messengers by bus with news about sickness or death or business deals. Money is exchanged by cell rather than making trips to the bank. Even staying in touch rather than frequent expensive visits can be done by phone or text. So even though time is money, phones are saving people money — probably saving them more than the cost of having the phone. I saw this billboard in the Tulsa Airport and it took me back to my early misperceptions of Oral Roberts University. As a child growing up in this part of Oklahoma, I didn’t understand what the whole person idea meant and even took it to mean that disabled persons were not admitted. This of course is not true, but it’s interesting how these misconceptions of others persists in various forms. The idea of the Whole Person is a good one, and it seems ORU was ahead of its time in pursuing a discipleship that integrates body and soul, health, life, mind. 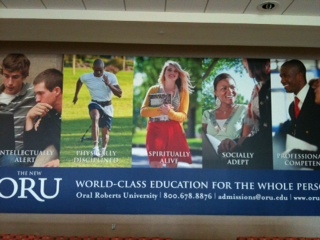 And to define the kind of student ORU is trying to produce, as in these five areas on the billboard, is noble and good. I feel much better and positive about ORU since the changing of the guard with new board members and president.